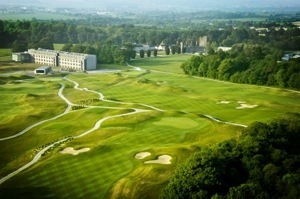 Irish Golf Tourism on the PGA Tour with the IGTOA! The Irish Golf Tour Operators Association, the IGTOA, has recently taken the bold move of an international promotional campaign on the PGA Tour in America with a view to promote Irish golf tourism in association with Fáilte Ireland, Tourism Ireland, airline partner Aer Lingus and car hire partner Hertz Ireland.The IGTOA will be attending a series of PGA Tour tournaments, to further the cause of Irish Golf Tourism, including the Fed Ex St. Jude Classic at TPC Southwind, Memphis, the Travelers Championship – TPC River Highlands, Conneticut, the John Deere Classic at TPC Deere Run, Illinois and the Wyndham Championship in Sedgefield CC, North Carolina. Golf Tour Operators from the IGTOA will be exhibiting at the the above PGA Tour Events in support of the IGTOA’s remit to increase golfing visitor numbers to Ireland. IGTOA Member Garreth Cooke, Managing Director of Links Golf Ireland will head up the team at the Fed Ex St.Jude Classic at TPC Southwind, Memphis, from June 5th – 8th 2014. Maurice O’Meara, General Manager of the Island Golf Club will also join the IGTOA team in Memphis to spread the message of Irish Golf. 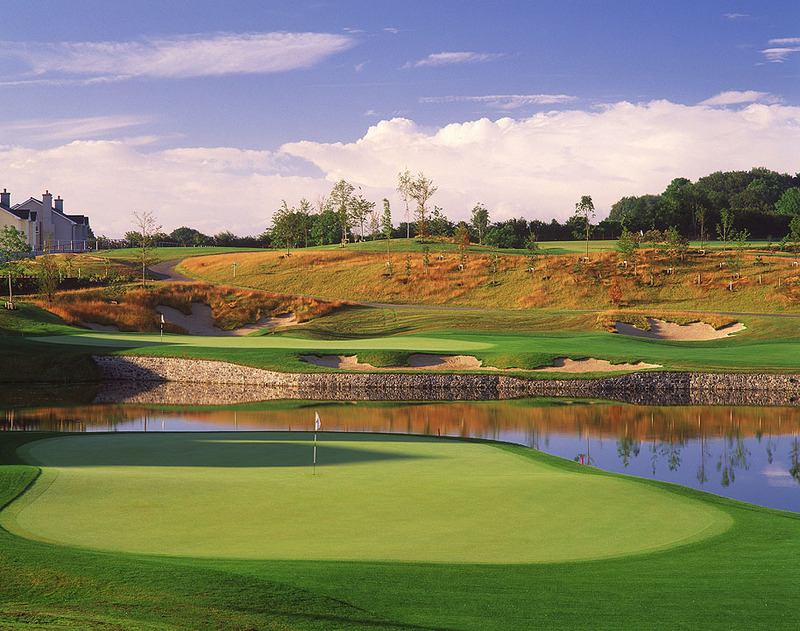 IGTOA Member Patrick Aiken, Managing Director of TheGolfPA.com, will head up the IGTOA promotion at The Travelers Championship at TPC River Highlands, Cromwell, Conneticut from 16th – 22nd June 2014 and will be joined by IGTOA National Executive Officer Stacey Williams. 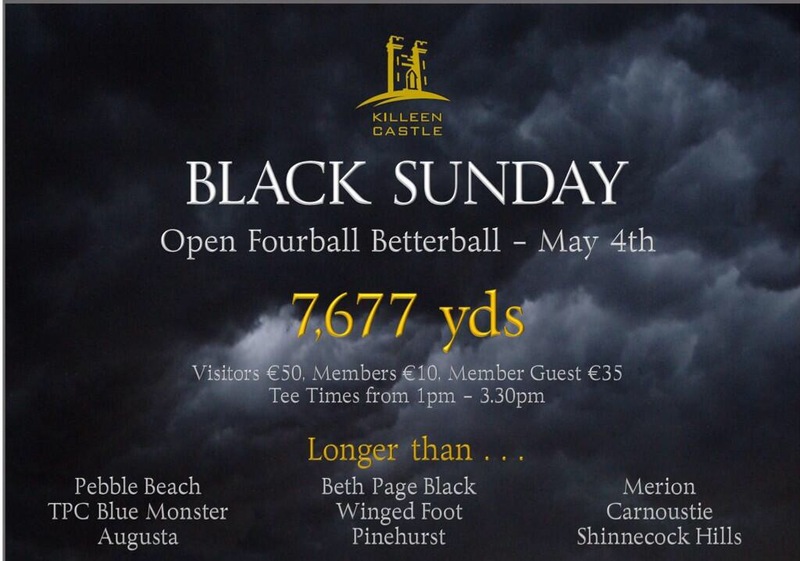 This particular promotion is also being supported by IGTOA Member Ireland Golf Travel and leading Irish golf courses Adare Manor Hotel & Golf Resort and Waterville Golf Links. The IGTOA is an internationally recognised organisation that is supported by Fáilte Ireland, the Northern Ireland Tourist Board and Tourism Ireland. The IGTOA has professional affiliations with the European Tour,the European Senior Tour, the Ladies European Tour, Ryder Cup Europe and Ryder Cup Travel Services, the Confederation of Irish Golf, the Golfing Union of Ireland, the Irish Region PGA, Visit Scotland, Golf Tourism Scotland,Golf Tourism England, Visit Wales, the Welsh Assembly and the Global Golf Tourism Organisation- IAGTO. 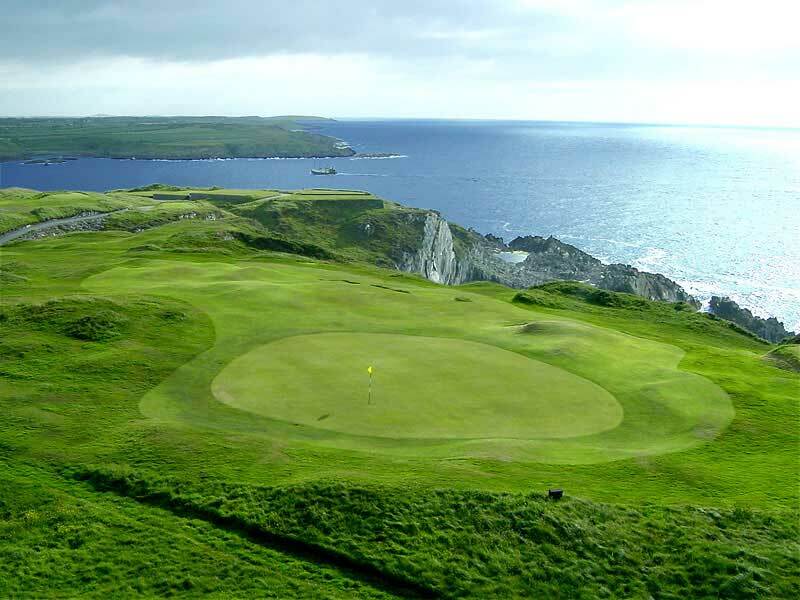 The IGTOA acts as the Voice of Professional Irish Golf Tourism and IGTOA Member Golf Tour Operators are collectively responsible for over 80,000 golfers visiting the island of Ireland, with an estimated consumer spend of €90 million to the Irish economy. The IGTOA participates in multiple overseas tournaments, trade shows and events all over the world each year to promote the island of Ireland as the world’s leading golf and sightseeing destination. 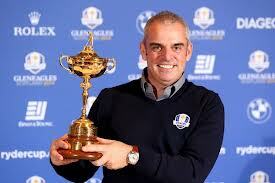 Stacey Williams, National Executive Officer, Ireland Golf Tour Operator Association. 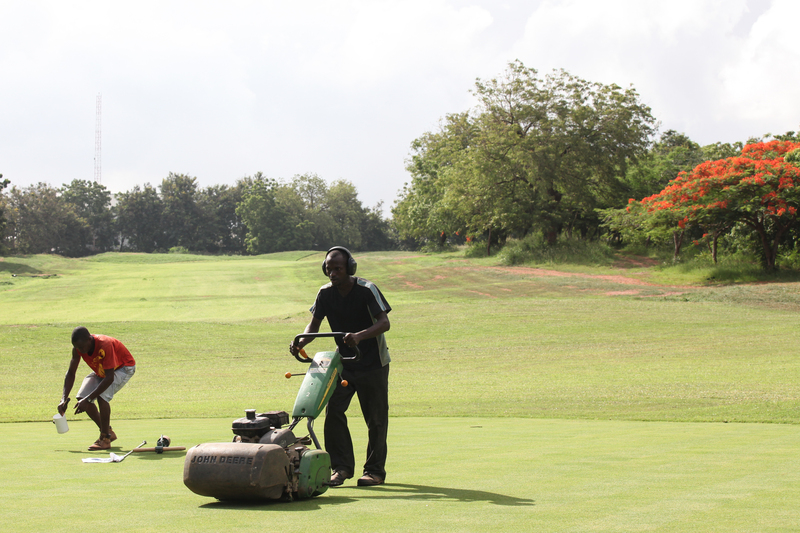 The redevelopment of Achimota golf course is nearing completion. 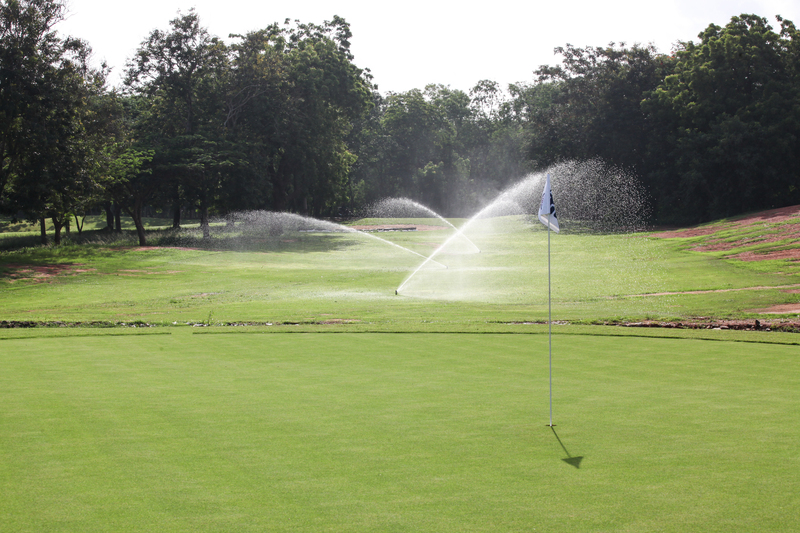 The course has been redesigned to USGA standard by Paul McGinley (2014 Ryder Cup Captain), with the project funded by Tullow Oil, while the Clubhouse reconstruction has been funded through Achimota Golf Club. The course is due to re-open in the near future and the Partial Re-Opening will be on Saturday 31st May & Sunday 1st June for Members only. 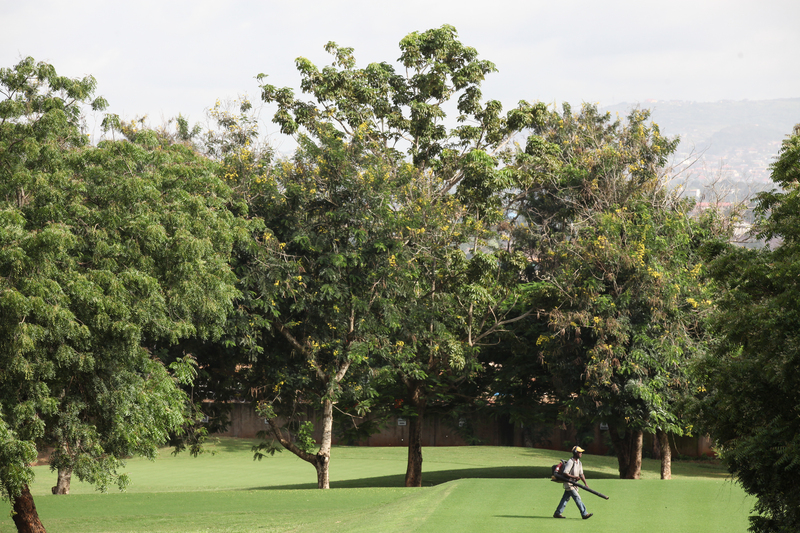 After that there will be limited play for Members only as well, until the course fully re-opens to the golfing public. Stay tuned for further details! 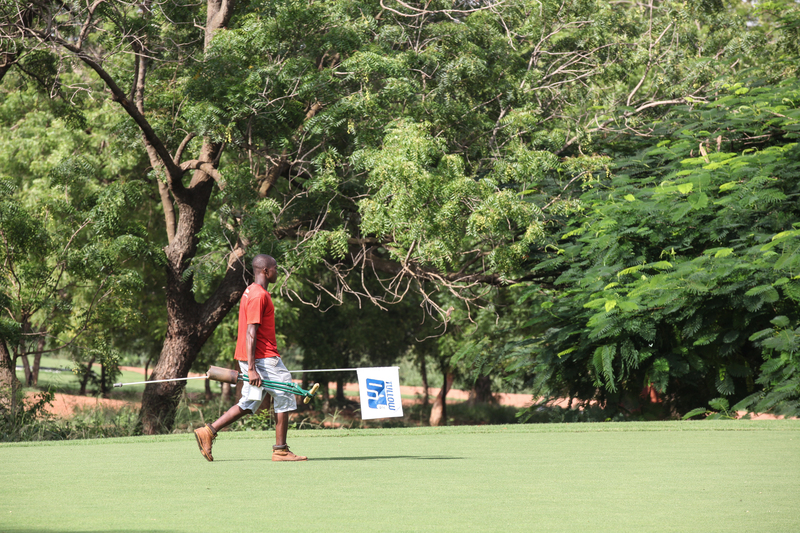 For membership and other enquiries please contact Achimota Golf Club on 026-2525725; email achimotagolf@yahoo.co.uk or you can contact Tom Kennedy, Director of Golf Ghana, on 054-0101707; email ghanagolfdevelopment@gmail.com. 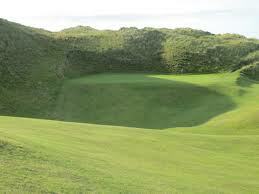 One of my favourite golf courses in Ireland is Enniscrone Golf Club. And it’s easy to see why. 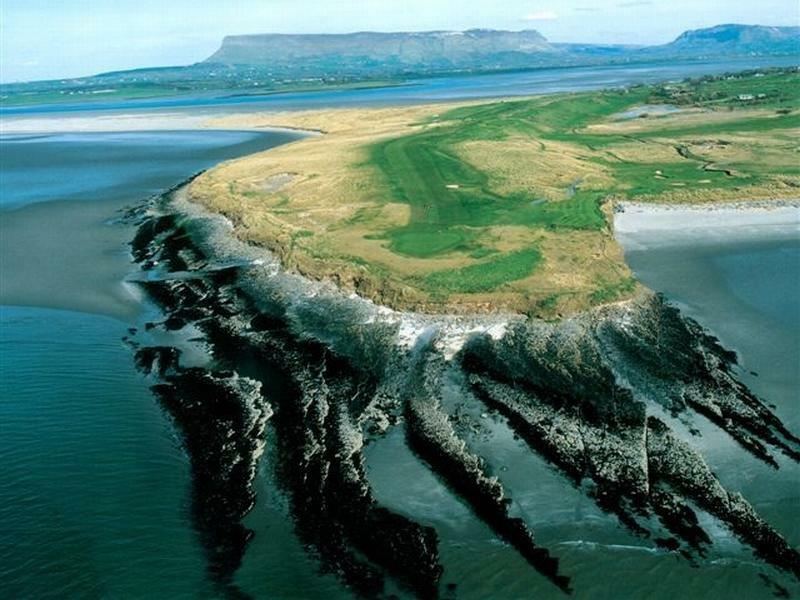 Fantastic location on the west coast of Ireland and some of the most spectacular links golf holes you’ll find anywhere. The stretch of holes from 11 home to the Clubhouse in particular are absolutely amazing and what links golf is all about! Enniscrone have some great competitions and events coming up over the next few months, and at great rates too!! 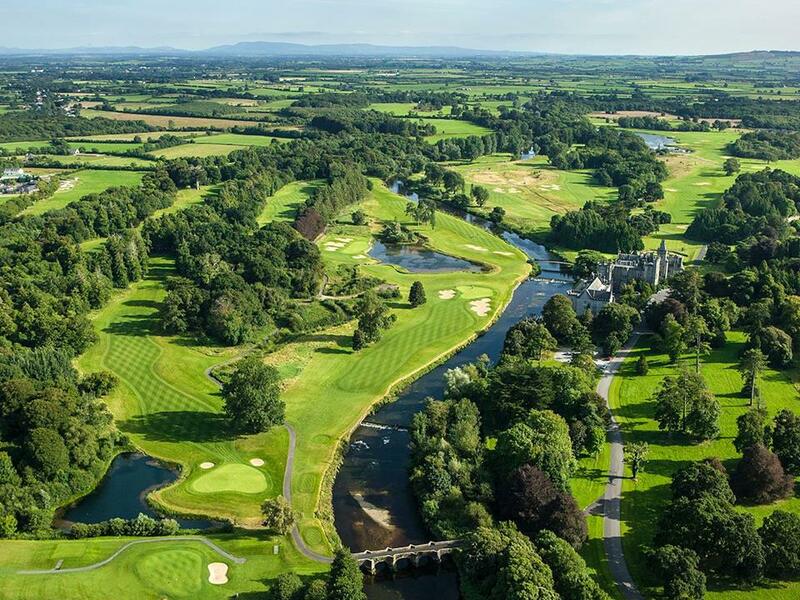 Their Open Week starts on Monday 23rd June and runs until Friday 27th with green fees during those few days only €30 per person! Some sponsors for the week’s competitions include The Ice House Hotel & Spa; Hollister ULC; Mount Falcon Hotel and the Diamond Coast Hotel. For more information call 096-36297 or email enniscronegolf@eircom.net. 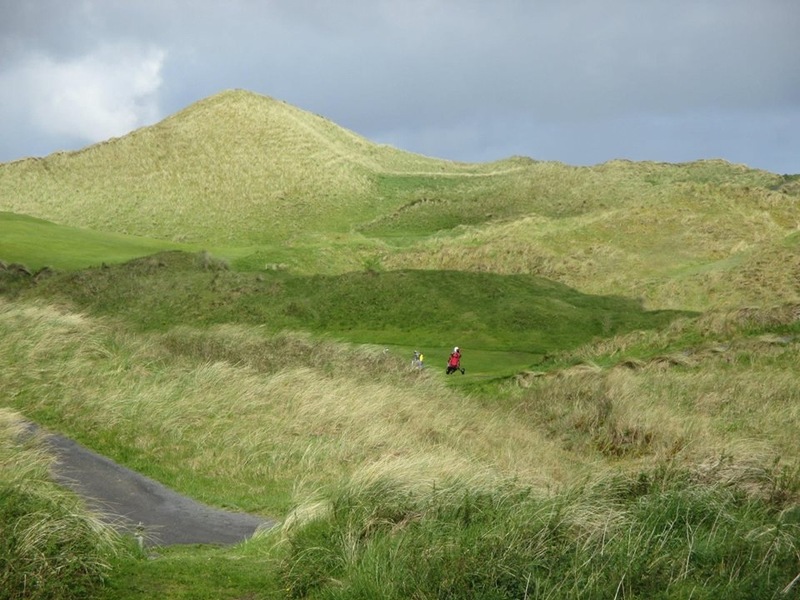 July is a busy month for Enniscrone and also Carne & County Sligo with the Atlantic Coast Golf Challenge and also the Social Media Links Challenge coming to these tremendous three tests of links golf either end of the month. 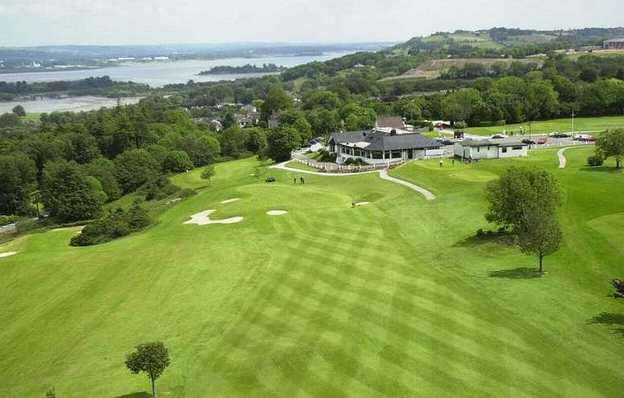 First up is the Atlantic Coast Golf Challenge which takes place from Monday 7th – Wednesday 9th July, this is a Team of 3 event with an Individual Competition also on during the 3 days. 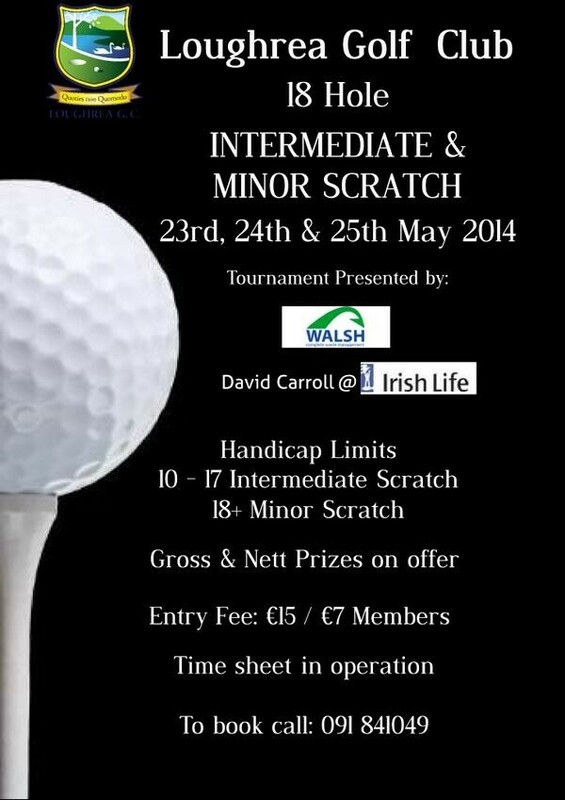 The entry fee is a mere €139 per person or €70 for Members. 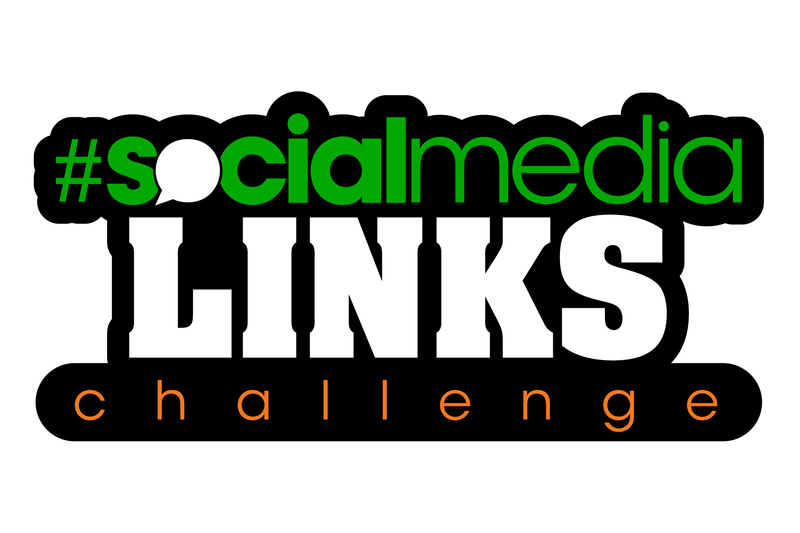 Next up in late July is the Social Media Links Challenge, this will be a Team of 2 Tournament with an entry fee of also €139 per person. 1st Prize will be a 4 day golfing holiday to Pestana in Portugal for the winning team (flights not included) through Tournament Partner, Golf Voyager. If you have any queries on this event you can email smlinkschallenge@gmail.com. 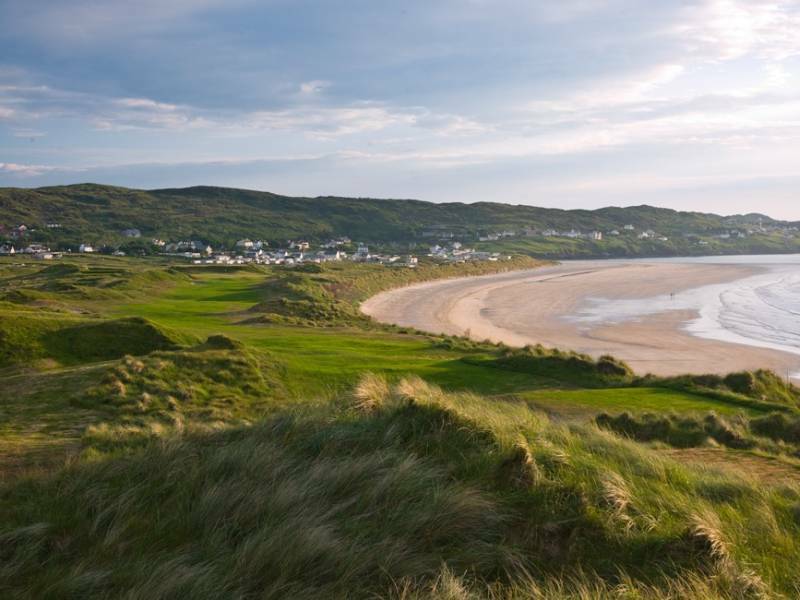 In September, from Monday 1st – Thursday 4th, Enniscrone will join Donegal GC, Bundoran GC & Strandhill in hosting the West Coast Challenge in a 3-person Team Event played over these 4 course in 4 days. 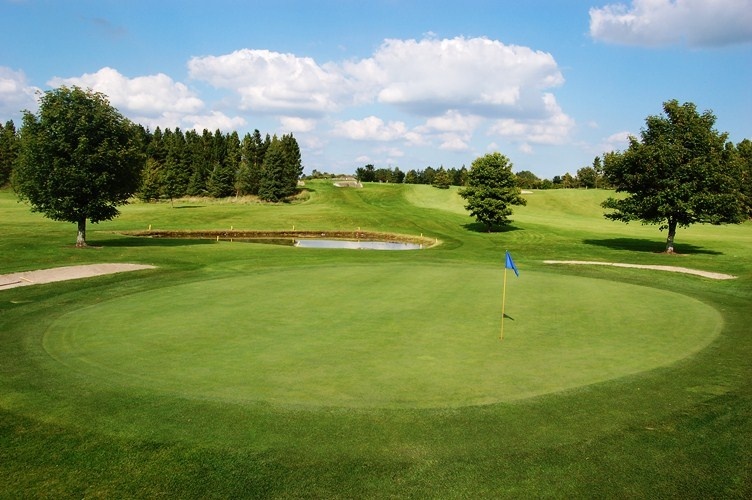 More great value here, only €130 per golfer! For further details check out www.westcoastchallenge.info. 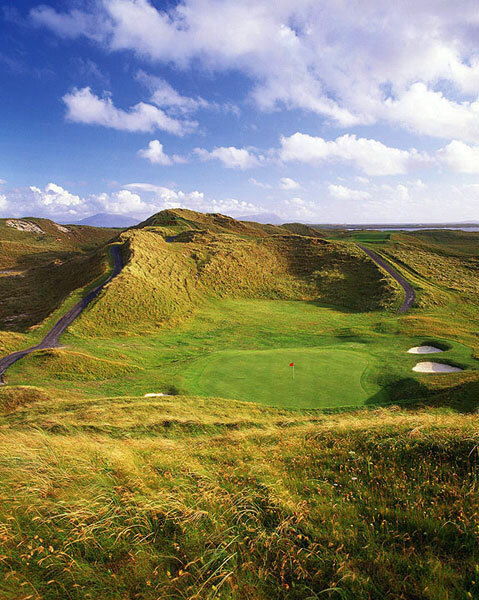 Enniscrone are also part of the Sligo Links Golf Pass where you can play County Sligo GC, Enniscrone & Strandhill for just €139!! 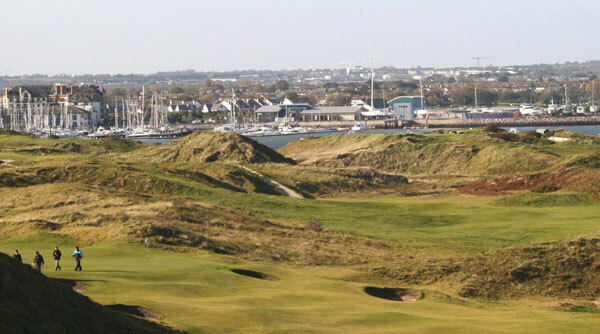 Other fantastic deals through Enniscrone Golf Club include Overseas Membership for just €300 per annum which includes a 50% discount on green fees at Portrush, Portstewart, Co Sligo, Carne, Donegal, Nairn & Portnoo, Rosapenna, Ardglass, Ballyliffin and Connemara. You can also avail of Overseas Life Membership for only €4,000 for over 55s, €6,000 for under 55s and also Husband & Wife. 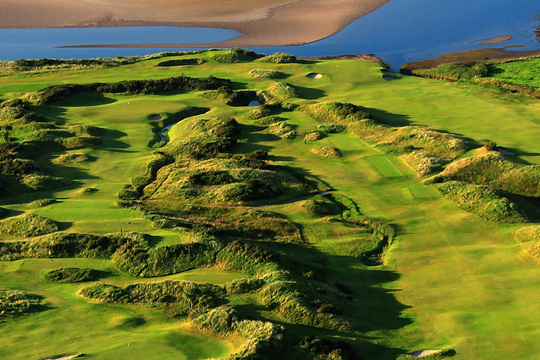 Check out Enniscrone this year and you’ll enjoy one of the finest links courses in the country. Give them a follow on twitter too if you’re a tweeting golfer, you can find them @EnniscroneGolf! 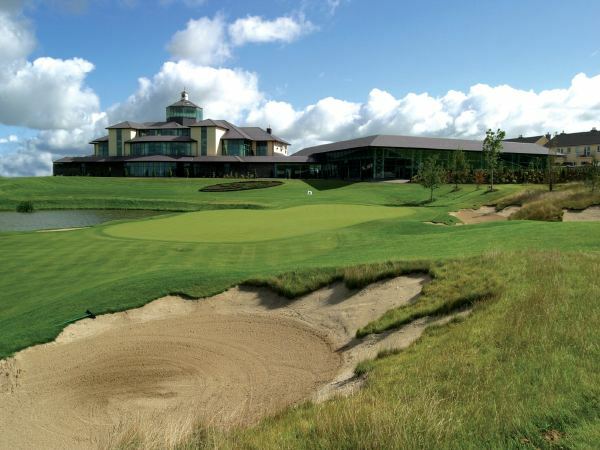 The fantastic golf brand, Druh Belts & Buckles, are holding their Inaugural Druh Cup Tournament on Monday 16th June at the Ballesteros Course at the Heritage in County Laois. This promises to be a fantastic day out with each player receiving a Druh Belt, Druh Polo Shirt & Goodie Bag along with Breakfast Bap on arrival (always a favourite of mine at the Heritage) and Buffet Dinner after golf. 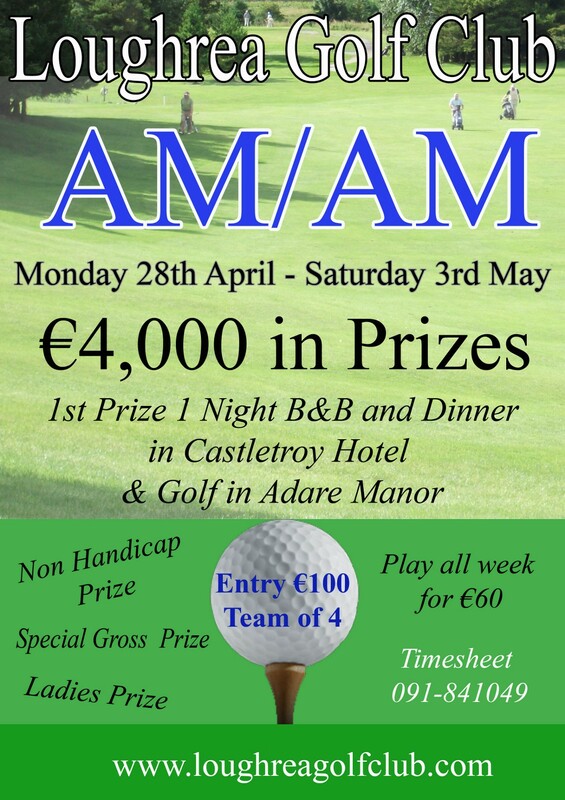 A team of 4 is just €300 per Team which is wonderful value! The tournament format is a 4-person team event with 2 scores to count on holes 1-8 and 10-17 and 3 scores to count on holes 9 & 18. There are some awesome prizes on offer for the Team Competition with a Longest Drive and Closest to the Pin to compete for too, each player will also get the chance to Beat the Pro, Gary Murphy, on one of the Par-3s on the day. For entry details please email druhbeltsirl@gmail.com or you can tweet them @DruhBeltsIrl! Junior golf resumes this coming Saturday with sign-in at 9.15am. Congratulations to our Fred Daly team of Mark Mac Grath, Michael Culhane, Mark Higgins, Eoghan C O’Neill, Ciaran Vaughan, Shane O’Neill and Boy’s Captain Michael O’Neill on their win against Adare Manor last Saturday in the Fred Daly Cup. The winning margin of 4 1/2 to 2 1/2 does not reflect what was in fact a victory by the narrowest of margins with two key matches going down the nineteenth. We can now look forward to the next round in late June when the opposition will be Roscrea. This Saturday sees the Jimmy Bruen Team in action against Rathbane in Adare Manor at 8.30 am. Best of luck to Maurice Fitzgerald, Finbar Carter and their team at the weekend. All support would be greatly appreciated. Entry to the Lyric Cup is now available in the Pro Shop and the first presentation of prizes is scheduled for the 21st May. As Course Repair work continues it is expected that the 3rd hole will return to a par 4 within the next 2 weeks. Members are asked to please repair pitch marks and rake bunkers. The Course Committee have reintroduced and Adopt A Green Policy and would ask members to help in eliminating pitch marks from our greens. Congratulations to our Miele cup team who had a great win against Charleville on Monday, well done to players and managers. Our Senior Cup team are playing in Killarney on Saturday, please come and support our team, team details are displayed on the notice board. The Lady Vice Captains Prize (Mary Lee) takes place next Tuesday with the prize giving that night. Timesheet for the Danus Cup is now open and on the notice board, please put your name up if you are interested in playing. Mixed Foursomes start this Friday night come along for a sociable round of golf. 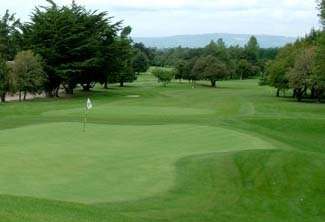 Helen Ryan Scratch Cup will take place Monday 12th and a New Member’s night will take place on Wednesday 14th May. 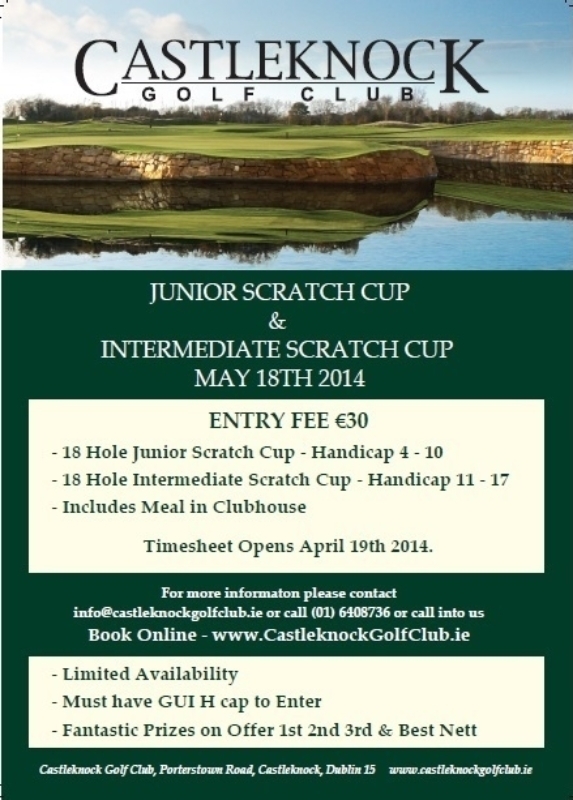 Castleknock Golf Club are delighted to announce that they will be hosting their first annual Junior and Intermediate Scratch Cups on Sunday May 18th. Fantastic Prizes will be on offer and the winners of each Scratch Cup will receive a Silver Trophy which their name will be engraved upon. 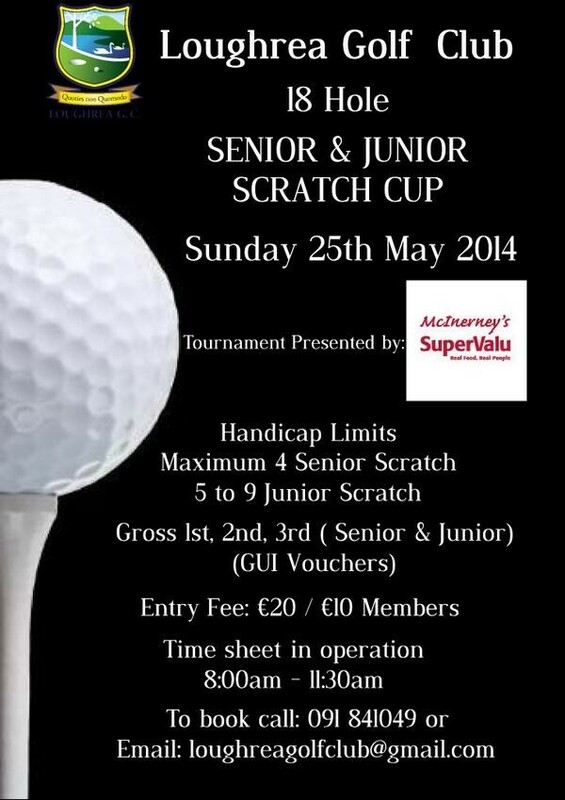 The entry fee is just €30 which includes a post round main course dinner in the Clubhouse. Bookings can be made over the phone by calling 01-6408736 and can also book online, CLICK HERE!